Let me ask you a question, what made you click on this post’s headline — whether you saw it on Facebook, Google, my homepage, or in an email? Maybe you clicked it because it promised to solve a problem for you — how to write better headlines? Or maybe because it promised you can learn to do it right away? Maybe you clicked because you were intrigued by the idea of a specific “Easy 4 U” formula. Or maybe it was all of those things put together — as prescribed by my formula. According to Copyblogger, eight out of ten people will read the average headline when they see it — but only two out of ten will read the associated blog post. That means, if you want to improve your odds of people actually reading what you post, you need to pay attention to your headline and make it as compelling as possible. That’s where the “Easy 4 U” formula comes in. 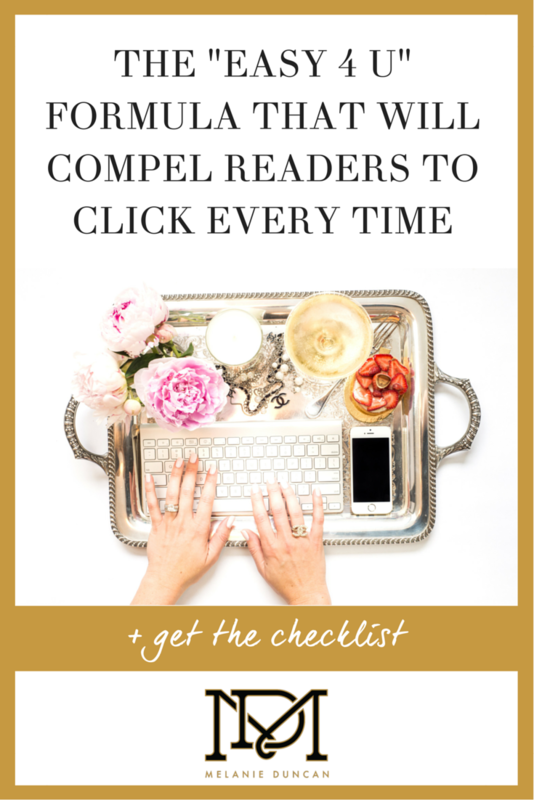 I’ve put all the details in this free printable checklist: Your Easy 4 U Headline Checklist. Click here to download it now. In the mean time, let’s go through each element one by one. Think about the articles you click on when you’re scrolling through Facebook or checking your emails in the morning. Likely the ones that pique your interest are the ones that offer something useful to YOU! Understanding what will be useful to your audience is part of understanding who they are and what they want. It meets them where they’re at, identifying a problem they may be experiencing or a solution they may be looking for. This isn’t just for service-based businesses, either. Products can be useful and solve a problem — even luxury products. My Custom Greek Threads clothing line solves the problem of finding stylish Greek clothing for sorority and fraternity members. It’s not world peace, but it is a problem that my audience experiences! With so much vying for our attention on the Internet, clever copywriters will build urgency into their headlines to compel the click. Well, any self-respecting adult who has children in their lives is going to want to know what that common household chemical is! It becomes urgent for them to tune in and find out — the same way it would be urgent for us to click and read. Of the four U’s, urgency is the trickiest to use and the one that might not always be applicable to your topic. So if you’re going to leave one out, it should be this one. Ever wondered why you see so many headlines that have numbers in them? It’s because numbers are one way to get ultra-specific. 70 At-Home Date Night Ideas To Try Tonight! When you put these four elements together, you’ll find you come up with better headlines every time. The only “trick” to getting people to click on your headlines is meeting them where they are: promising them a useful, urgent, unique, and ultra-specific answer to their problems. 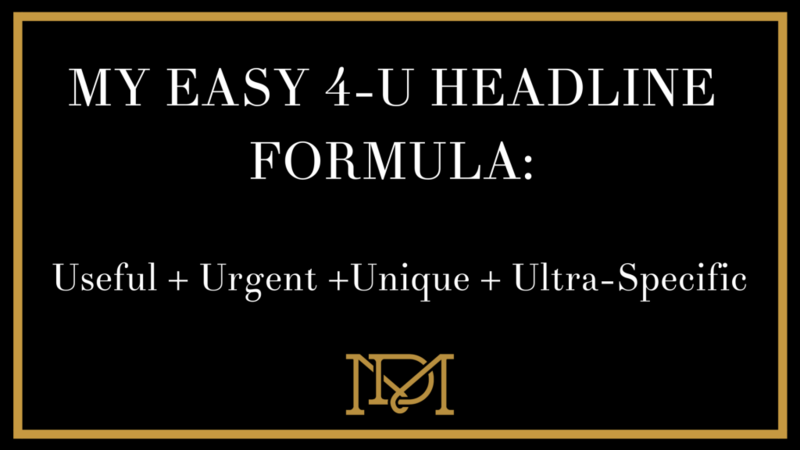 Don’t forget to download Your “Easy 4 U” headline checklist, so that you can easily remember the 4 U’s when writing your next headline. Click here.